"It was having the structure, the positive role models," said Jennifer Rahwan about why she signed her son Arlei up for karate at the Personal Best Karate in Norwood. "It was the perfect place for him." Arlei, a shy sixth grader from Westwood with high functioning autism and ADHD, has blossomed at Personal Best. "I heard karate is really good for kids like Arlei," said Jennifer. "My girlfriend's daughter went to PBK in Norwood, and when I heard the owners had a child with autism, I knew it would be the right place." And she was right. "Arlei just grasps karate better than I thought he would have. He just gets it," she explained. "He really likes it and has made a couple friends there." PBK Head Instructor John Mosca agreed. "Arlei puts a lot of work into his training, but it's his thing," he stated. "He know the true meaning of working hard and accomplishing what he sets out to do." 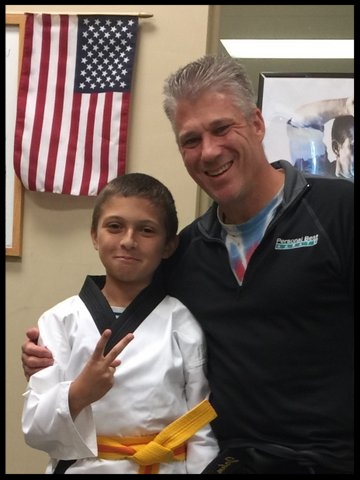 A basketball player and a big Patriots' fan, Arlei is now a Green Belt. His biggest fan besides his mother is his younger sister Maria, a 10-year old who has Down syndrome. She is a fixture at the karate school as she announces,"Yes, sir!" along with the members of the class, always with a smile on her face. But it is Arlei's ability as he continues to get better focusing and beating those challenges that make him a karate student to be proud of, said Mr. Mosca. "He has come a long way."